Metal maniacs, rejoice! 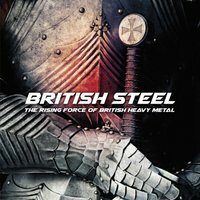 I'm proud to present to you: VARIOUS ARTISTS; signed via Dissonance Records, hailing from various countries - performing Heavy Metal, on the album “British Steel: The Rising Force Of British Heavy Metal” (released August 22nd, 2017). Forming a profuse amount of New Wave Of British Heavy Metal influenced quintets; the compilation comprises of 11 quartets, and 11 tracks which range at around 44:17 - arranging an intricately designed formula of hard-hitting Heavy Metal strength, this unique collection starts off with AMULET performing “Highwayman”. The song kicks off with a solid slab of bouncy melodies which consistently demonstrate the NWOBHM (New Wave Of British Heavy Metal, if you have been living under a rock for the past decade or 2, or 3) development. AGGRESSIVE PERFECTOR's (brazenly stealing the name from the JUDAS PRIEST classic) “Harlot Spell” sounds like a more hostile ridden IRON MAIDEN track from the Paul Di'Anno era, it's a hastily filled galloper full of menacing vocalization - hooks and solos, while contrasting with robust progression and technicality…very concrete stuff so far. Consisting of ELIMINATOR's complex version of “Lost To The Void”; which has a lo-fi THIN LIZZY characteristic, amalgamated with an early MANOWAR vibe in the songwriting. The dexterity is efficiently composed, with meaty riffs that showcase a distinct sound production which is represented with savagely sinister orchestrations. DUNGEON's “Queen Of Sin” has a dark; thrash punchline with raspy, throated vocals that almost mimics VENOM's organically aesthetic substance. The instrumentation and musicianship is proficiently dominant; with speed, fury and high-pitched yelps. DARK FOREST's “Where The Arrow Falls” is the next in line; constructing folk/power metal inspired implementations, which sounded incredibly cheesy but significantly fun in the long run - though, there is an admirably dynamic distinction in the memorability which makes it enlightening and original - to an extent. TOLEDO STEEL's “Rock Nights” has groovy riffs and accelerated relentlessness that's salubriously stimulating, it's a fulfilling track which has immense Rob Halford/King Diamond differentiations in their own - prominent way. The 2:30 track “Iron Witch” from the band VULL reminds me of MOTORHEAD, featuring rapidly swift executions and entertaining madness that will guarantee to give you quite the kick. SEVEN SISTER's “The Witch's Eye” is a melodically paced track, thunderous riffs and brilliant guitar soloing with heart-racing, pummelling drums and massive bass attributions that flourish with intense pounding. INSURGENCY's “Destined For Death” is a metal, thrashing mad track that will have you air guitaring at the sheer intensity and power the band establish. While NEURONSPOILER's “Slay The Beast” gallop away with more classic driven NWOBHM theatrics that absolutely and ultimately begs a listen. Overall concluding “British Steel: The Rising Force Of British Heavy Metal” with the finale band WYTCH HAZEL and their song “Freedom Battle”, I was pleasantly surprised with this here release. It's certainly worth checking out by all Heavy Metal fans alike, go get it.